It's a great idea, but considering Rebellion didn't have capacity to do the Carlos colouring book, I wouldn't hold your breath. You know that for a fact? They couldn't do it, or did they just not want to…? Well that's the only account out there that I've seen from Pat, and I've not read statements to contradict that from Rebellion. The worst thing I could say about the con was that the artist room was pretty stuffy, although nowhere near the hottest I've been to. Burdis and I were in there sweating while queuing after midday. Burdis said something like 'You'd think they'd sort the air con in here' to which I replied 'Isn't that the switch over there?'. One flick of Burdis's finger later, and the room miraculously became a lot cooler. Who'd a thunk it? Anyway, epic con, totally bloody loved it - really annoyed Rebellion have given it the red card in it's current form. It's almost as if they don't want fans of their IP to get together and celebrate it. I reckon the next version should be called 'Super Armoured Future Cop' or somesuch. That aside, I did my first ever exhibit of anything ever - a mix of my models and contributions I'd managed to round up from others in the weeks leading up to it. I was very pleased that my grubby cabinets filled with random tat seem to garner such praise. Thanks to anyone who swung by and had a look! I think the highlight for me was Glenn Fabry's panel, when he described what happened when he and that Dominic Whatsisface from Preacher appeared at the same con in the US. It was hilarious. You had to be there. Anyway, epic con, totally bloody loved it - really annoyed Rebellion have given it the red card in it's current form. It's almost as if they don't want fans of their IP to get together and celebrate it. sell bootlegs of it. I think you have to treat those sort of statements with a tiny pinch of salt. For all we know, that might have been the most tactful way they could think of to phrase "we're not going to touch this with a bargepole." As someone who was actually there, helping out on Dan's stand he did very well out of selling licensed stuff. Things like the LG t-shirts, seems a bit of a stretch to claim ownership on a word that predates Dredd or Rebellion's use of it. Certainly compared to people having webstores selling 2012 helmets/stuff that they appear not to be able to do anything about, it was small beans. I have no inside track on this, but it looks like Rebellion feel differently. I'm not sure how often it needs to be explained that companies that don't defend their IP run the risk of creating precedents and loopholes that can bite them in the arse very badly when they really need to defend their copyrights, but they do. I think you get that, Steve, but there seem to be lots who don't. People cry 'But I had to buy Heavy Armoured Cop because Rebellion wouldn't make one' … well, Rebellion wanted to make one, and negotiations for the license to do something of that ilk were directly torpedoed by the influx of the bootleg figures into a very small niche market. Bootlegging has consequences, and we, as fans, should be more cognisant of them. Shutting down a bootlegger in another legal jurisdiction is a lengthy, expensive, complicated process. It's not 'low hanging fruit' to go after the domestic ones, it's just as necessary, but it's also easier and quicker. I'm not talking about other jurisdictions, Jim. There's also the twitter kicking that Jason got when Rebellion tried to extend usage of Rebellion. I just find it slightly hypocritical that on the one hand they'll clap their hands when parody law change allows them to print Ronald McDonald executing an employee, but have an attack of the vapours over this. What I saw was a bunch of sellers selling official merchandise, or original pages from the comic, or licensed stuff from the likes of Planet Replicas. I even saw people selling stuff that bore no relation to 2000AD (such as the bookstall), but were licensed goods nonetheless. Even the tombola was to win all fully licensed and already paid for items. There were some Lawgiver tees on sale, the profits from which got ploughed straight into next year's event, where more licensed stuff can be sold - such as more Planet Replicas gear. 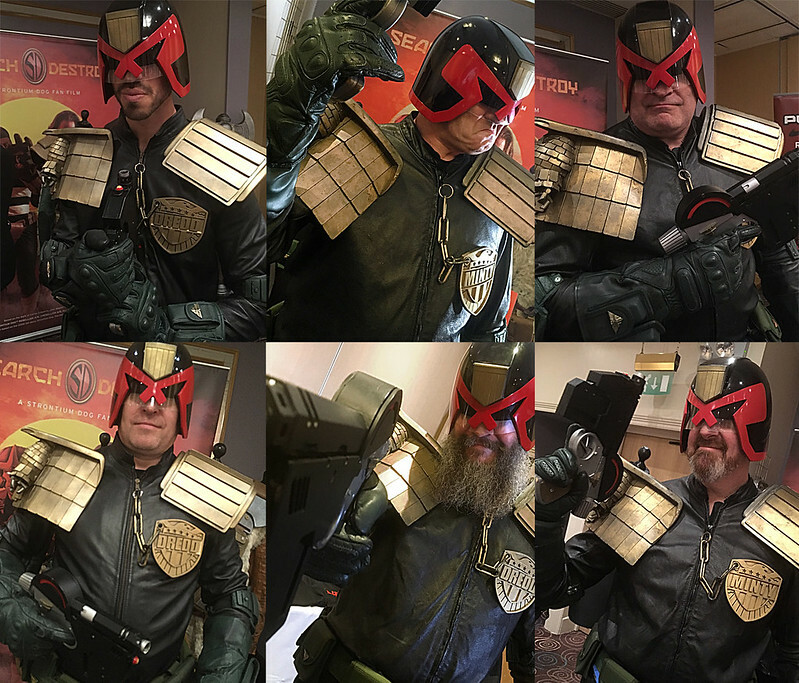 I also saw a lot of eager fans showing off their homemade costumes of the 2000AD universe, surrounded by a bunch of great artists all there to sign the hundreds of already bought and paid for copies of licensed graphic novels and comics. I got two copies of 2000AD signed myself, and got lots of awesome sketches that I didn't pay a penny for. I also got to display my own models from the 2000AD universe, brought to the convention under my own steam at my own expense, none of which were for sale. That was the same for everyone else who contributed to my exhibit. It was an absolute joy from start to finish. Rackle and I turned up about the time you were on the home stretch of laying out the Citadel (?) figures, but we returned later to look at the complete display. Rackle says "It was nice to see Sensitive Klegg in the flesh"
For those of you who didn't get to LawgIVer, I've got a 'very' limited number of the Zarjaz programmes from the gig. If anyone out there wants one, then they will be free with orders as long as you let me know you want one. Reminded me of the old Doctor Who and Star Trek conventions, that you see photos of, before they returned to mainstream and went mega. When they were being kept alive by the fandom. I went to a Blakes 7 convention last year and it had a similar vibe. Fan fuelled and very positive. The guest list was insanely good. I wanted to grab a chat with Mick McMahon and thought I’d wait until his queue went down, but it never happened. I was letting people try on my Planet Replicas Judge costumes. Lots of takers (see photo of a small selection). Planet Replicas seemed to be shifting some stock. Lots of interest and feedback on their up coming products. Cheers, glad you enjoyed! SK remains my favourite of all the models I made, but some seemed to like Werewolf Dredd too, and I know at least one person would have loved their own Don Uggie! Later in the afternoon I was able to stand next to it and chat to folk about all the models and contributions. In particular I loved showing the Globular Rad-Sleet simulator in action! I think I need to think of adding other moving elements to future models, as shaking up that globe really brought the scene to life. At least one person asked where I had bought it, and raised an eyebrow when I said I made it! Richards miniatures caused all kinds of nostalgia for the tabletop gaming of our youth, and Sarah Lea's steampunk Lawgiver garnered admiration from all! I recommend you get in there fast folks! Mike Collins did a superb cover, and the content is very enjoyable indeed! Kudos to all at Zarjaz for doing this! Thanks for the link Shaolin, and even Nano-bolt thought your models were actual releases. Particularly sensitive Klegg.